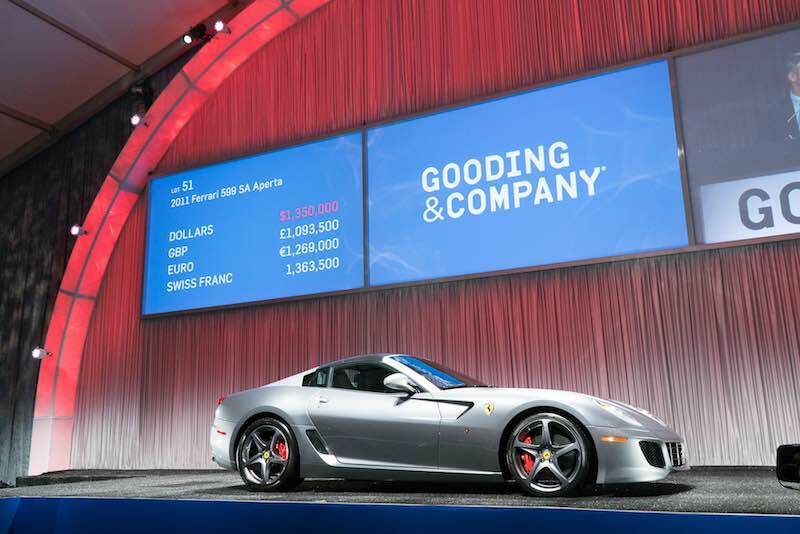 The Gooding Scottsdale 2017 auction was held January 20-21 nearby the Scottsdale Fashion Square in Scottsdale, Arizona, resulting in more than $33.4 million in total sales and an 84 percent sell-through rate. President David Gooding and Auctioneer Charlie Ross sold 106 of 126 lots at Gooding’s 10th annual Arizona Auction Week sale, with an average price of $315,327 per car sold. 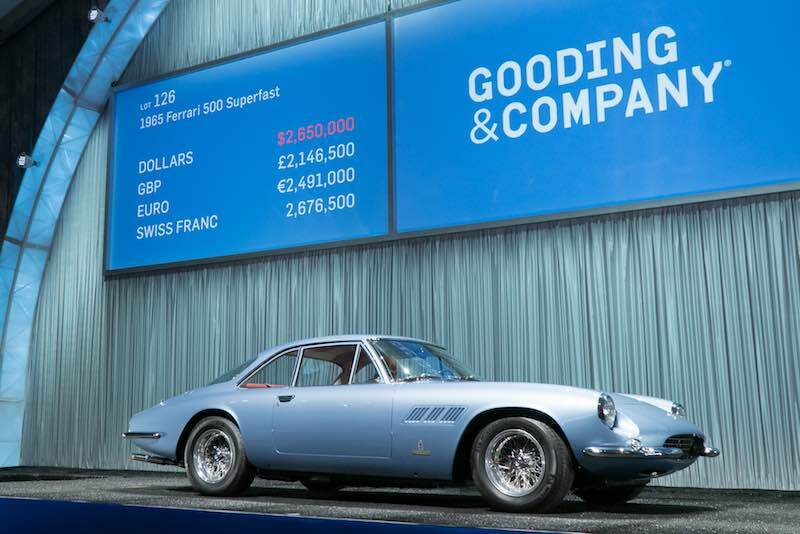 The 2017 Gooding and Company Scottsdale sale posted nine new benchmarks from Ferrari, Bugatti, Porsche and AMC. The most notable sales were the highly original 1925 Bugatti Type 35 Grand Prix, which sold for a world record price of $3,300,000 and the 1965 Ferrari 500 Superfast, which sold for $2,915,000. Pre-war classics attracted strong bidding from the standing-room-only crowd, as the 1932 Alfa Romeo 6C 1750 Series V Grand Sport sold for $1,595,000, the 1928 Bentley 4 1/2 Litre Open Sports Tourer sold for $1,100,000, as well as the 1935 Auburn 851 SC Boattail Speedster sold for $693,000. A new world auction record was set with the 1920 Stutz Series H Bearcat that sold for $451,000. Paddles were also flying for Postwar sports cars, with the 1969 AMC AMX/3 selling for $891,000, a world record price for the AMC marque. 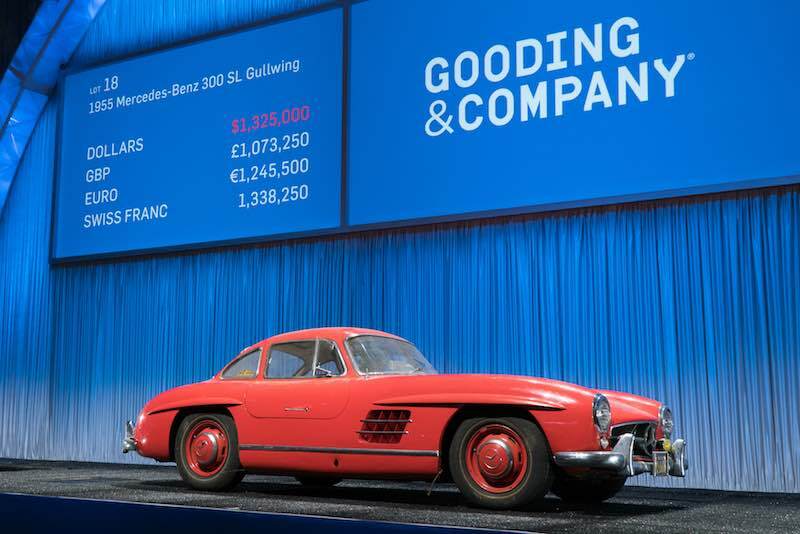 Additional sports cars sold included: the 2011 Ferrari 599 SA Aperta sold for $1,485,000, a record price for the model, the one-owner 1955 Mercedes-Benz 300 SL Gullwing sold for $1,457,500 and the 1964 Shelby 289 Cobra sold for $1,100,00. Gooding & Company’s next auction will take place in Amelia Island, Florida, on Friday, March 10th at the Omni Amelia Island Plantation. The sale will include an array of motorcars from a variety of marques. Most notably, four supercars from a private Porsche Collection will cross the auction block, consisting of the 1998 Porsche 911 GT1 Strassenversion, the 1993 Porsche 964 Turbo S Fleichtbau, the 2011 Porsche 997 GT3 RS 4.0 and the 2011 Porsche 997 GT2 RS. Another highlight will be the 2015 McLaren P1, with proceeds from the sale benefiting a professorship at the Rose-Hulman Insititute of Technology. In addition, Gooding & Company will present a selection of race cars, including the 1989 Mazda 767B and the 1977 Porsche 934/5.